This is the bit where I round up all the songs I didn't have time to write about over the last week (and it's been a busy week - with trips to Leeds and Bradford and Manchester - so I didn't have time to write about much). XO is the most songy song on Beyonce's Beyonce, so this strummed acoustic cover was guaranteed to work from the off. Beautifully understated, with none of the bombastic grandstanding of the original. My erstwhile colleague, Radio 1's Sinead Garvan, had a shocker while interviewing Sam Smith at Radio 1's Big Weekend last week. If you haven't seen it already - here's the video. Sam's face is priceless. Maybe that's why he's smiling from ear-to-ear when he takes to the stage. Or maybe it's the incredible reaction. Either way, it's a lovely, inclusive performance. "Playing a brand new never before heard song on jools tonight," tweeted Ed Sheeran last Friday. "It's my favourite track on the album." It's easy to see why. This is a superbly-crafted, heart-on-sleeve love song. The sort of thing you'd have expected from Tracy Chapman or Paul McCartney at the peak of their powers. Yes, it's really that good. Even Jools's boogie-woogie piano can't ruin it. 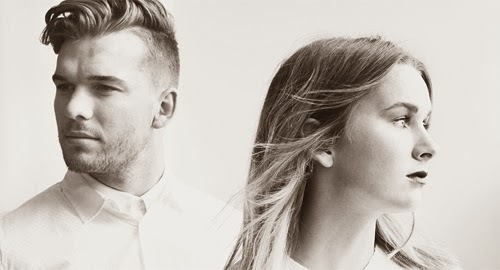 Not-entirely-unattractive pop duo Broods (see above) first released this single as a free download in 2013. But now that the New Zealanders have got a "proper" record deal in the States, the song's been given an expensively hazy Instagram-style video. Shot around the Castaic Lake in the Sierra Pelona Mountains, it's a perfect fit for the song's moody electronic swoosh. So, basically, the La Roux song that came out a fortnight ago was a "hey, we're back" kind of thing and this is the proper single that you'll hear on your radiogram this summer. As many people have already noted, it sounds a lot like David Bowie's Let's Dance. But while Bowie was all "heyyy, let's party," Ellie Jackson is having really deep thoughts about her generation and stuff. "It's kind of very loosely based on the London Riots," she told Triple J radio. "I grew up in Brixton where the first riots happened... It was interesting to see people of my generation try to at least get up and stand up for what they believed in. "I think it's just the energy people would have liked to have seen from those riots and I kind of tried to turn a negative into a positive." Foster The People's second album, Supermodel, hasn't exactly set the charts on fire in the UK, but they made the Top 10 in the US. Which is good news, because it means the band keep getting to make their excellent videos. Directors Ben and Alex Brewer helm the latest clip, which takes a B-Movie look at fashion week. The models may be stick thin, but they have a voracious appetite... FOR HUMAN FLESH! Displaying the expert timing of a blacmange, Miguel has just released a video for a song he debuted in January. But we can forgive his tardiness when the song, originally featured in Series 3 of Lena Dunham's Girls, is so gorgeous. "Laugh with me baby," he croons over an indistinct, sawtooth bassline, "I just want the simple things." The Pierces' new album, Creation, has just been given a highly-justified four-star review in Q Magazine, while the lead single, Kings, is on Radio 2's A-list... So things are looking up for the Alabama sisters. The video, shot in the Los Angeles desert, has a tribal theme with Allison and Catherine slapping on the warpaint and going to battle. But this is no Braveheart - no-one's head gets chopped off and everyone stops fighting at sundown to have a nice bonfire. A little teaser for Lana's Ultraviolence album, which arrives in a fortnight. All twangy steel guitars and brushed drums it shows more clearly than West Coast how she's moved away from the trip-hop trappings of her debut. The mid-point guitar solo (!) is hair-raising. I finally got to see Prince play one of his Hit and Run shows in Leeds last week - and was utterly blown away. Thanks to his muscular, compact new band 3rdEyeGirl, he's ditched the Vegas vamp that's characterised his live shows since the Musicology tour ten years ago. "If you haven't noticed there's been a turn towards the guitar these days," he said, as his fingers blurred over the neck of his Telecaster. He even nabbed Ida Nielsen's bass for an impromptu bass solo during a rendition of Alphabet Street - just one of half-a-dozen songs I've never heard him play before (I nearly died when he played the opening chords to Sometimes It Snows In April). My official review is on the BBC site, and here's the peerless setlist. Surprisingly, one of the highlights was his newest song, The Breakdown. Still no word on a UK release, but the song just got a teaser video on the 3rdEyeGirl Youtube channel. And that's a wrap. Have a great weekend!